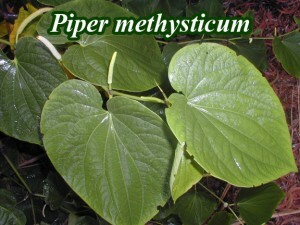 PLANT NAME: Piper methysticum, Forst. 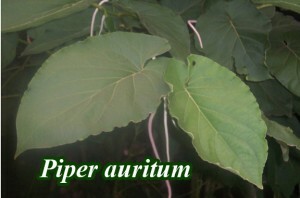 COMMON NAMES: ‘Awa, kava [Hawai’i]. FAMILY: Piperaceae. 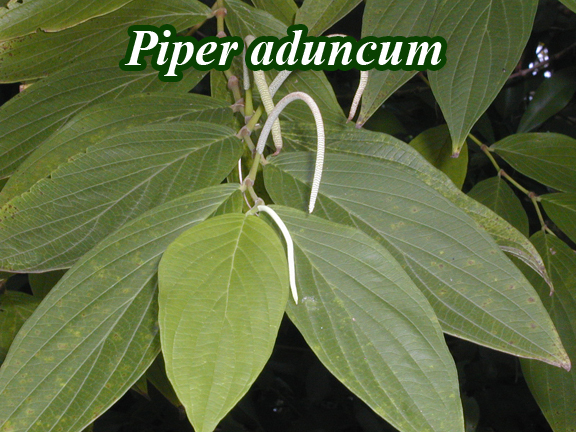 The family Piperaceae has within it five genera comprised of more than 2000 species, more than 1000 of which are in the genus Piper. RANGE: Pan-tropical. Indigenous to the Pacific Islands: Melanesia, Micronesia, and Polynesia. In double blind clinical trials kava has been shown to reduce anxiety [Kinzler 1991, Volz 1997], with the effects more pronounced after eight weeks of use [Volz 1997]. The mechanism is unclear. It may be through the modulation of serotonin-1A receptors [Walden 1997], although one study did not find kava constituents altering dopamine or seratonin levels in rats [Boonen 1998(b)]. In any event, a meta-analysis of double blind, randomized, placebo-controlled studies has verified that kava outperforms placebo for symptomatic treatment of anxiety [Pittler 2000]. It does not induce tolerance in mice [Duffield 1991]. In animals, kava works as a hypnotic through mechanisms unrelated to benzodiazepines or tricyclic thymoleptics [Holm 1991]. One study reports that its effects may be unrelated to any actions on GABA or benzodiazepine binding sites [Davies 1992], but others report GABA activity [Jussofie 1994, Boonen 1998(a)]. Methysticin reduces seizure activity in rats [Schmitz 1995], and muscle contractions (and presumably spasms) in frogs [Singh 1983]. There is evidence that ‘awa reduces current though voltage-activated sodium (Na+) and calcium (Ca2+) channels [Schirrmacher 1999]. It reduces amphetamine-induced excessive movement in rats, but much less than haloperidol or chlorpromazine [Duffield 1989]. As an analgesic it works through non-opiate pathways [Jamieson 1990(a)]. The extract prevents ischemic brain damage in mice [Backhau 1992] and in rats [Gleitz 1996]. Kava lactones may inhibit MAO-B in human platelets [Uebelhack 1998]. Kavain reduces human platelet aggregation through suppression of arachadonic acid and inhibition of cyclooxygenase (COX) [Gleitz 1997]. The extract is mildly anti-fungal [Locher 1995]. One study showed an inverse correlation between kava consumption and cancer in Pacific Island Nations [Steiner 2000]. In a small double-blind placebo-controlled study menopause symptoms were alleviated by kava extract [Warnecke 1991]. Interestingly enough, in spite of my caveats (See CAUTIONS AND CONTRAINDICATIONS), clinical trials indicate that Piper methysticum does not impair the ability to concentrate or reaction time. In one double blind clinical trial kava was shown to improve cognition [Munte 1993]. At therapeutic doses it may actually improve performance [Heinze 1994]. In another study, people taking kava with alcohol had better cognitive function than those taking alcohol alone, [Herberg 1993], although a study in mice showed alcohol potentiated kava and increased its toxicity [Jamieson 1990(b)]. TOXICITY: Kava resin is non-lethal given orally to mice at 600 mg / kg (heavy kava users consume roughly 133 mg / kg of kava resin per day) [McKenna 2002]. The oral LD50 of kavalactones for mice has been reported in the range of 920 – 1,050 mg / kg, and the injection LD50 at 300-400 mg / kg. 50 mg / kg doses given three times a week for 90 days caused no toxicity in rats. However, alcohol (ethanol) injections in mice can increase the toxicity of kava resins given orally, with small increases in alcohol resulting in large increases in toxicity [McKenna 2002]. ‘Awa is known to cause a reversible scaly skin disorder among chronic users called “kani kani” in Fiji or “ichthyosiform eruption” in medicalese. It is thought to be due to interference in cholesterol metabolism. In order to acquire this condition, one would have to ingest a lot of kava for many months. I have never seen this condition, even in Hawai’i where there are numerous kava bars. • Most side effects involve gastrointestinal discomfort or skin allergies. Some varieties of kava will cause stomach discomfort after only two or three servings. Even with some experimenting I’ve found no way to counteract this, although mixing with coconut water and eating ginger can sometimes help. • Varieties to be avoided include “Tudei” (so named because one can feel its effects for two days) and P. wichmannii. Because kavain turns to dihydrokavain with age, fresh ‘Awa may be less disturbing to the digestion than dried. Continued chewing of the root is reported to damage tooth enamel. Do not use in Parkinson’s disease. There have been case reports of possible dopamine antagonism from kava extracts. Until more information becomes available, Parkinson’s patients should avoid using kava [Schelosky 1995]. In one Australian study, kava users were more likely to complain of poor health. Users showed increased HDL cholesterol and red cell volume, decreased platelet volume and lymphocyte count, and a higher incidence of hematuria than non-users. Very heavy users were 20% underweight [Mathews 1988]. Do not use large doses while driving, skydiving, performing neurosurgery, competing in a chainsaw toss, or with any piece of equipment more difficult to operate than a spoon. I’ve met Polynesians who have told me of “driving home by Braille” (using the highway bumps to keep them in their lanes) after a long night of ingesting too much kava. While there is some controversy regarding the historical existence of a Hawaiian ‘awa ceremony, other Polynesian cultures have used ‘awa ceremonies for centuries. These ceremonies are important as a means to welcome guests and to create social bonding in Polynesian societies.